Put that in the context of an imaginary payroll software company: understanding what payroll software needs do do is fairly straight forward, most products on the market will do the same thing. But what makes the product competitive is how well it does it. It relatively easy to list the things your software should do but listing how the software will be more competitive than the opposition, or delivery real business value - rather than a shopping list of features - is more difficult. Continuing my follow up to my latest tell of the Alignment Trap in the Agile Journal and on InfoQ. Lets get one thing straight: I’m not saying requirements don’t matter. What I’m saying it: when the context is a broken development organization the most important thing is fixing the delivery process. In which case, you can, and should, take liberties with the requirements process. Then, when delivery shapes up you should come back and fix the requirements issues. Because requirements is where the long term gain is. Anyone who thinks I don’t value requirements should look at all the postings on this blog about the importance of Product Managers. The requirements is also where the long term future of Agile is. • Maintenance zone: this segment explains why so many of my friends work at dysfunctional IT shops. • Alignment trap zone: this explains the traditional approach has failed so badly; companies tie themselves in knots trying to do the right thing when they can’t actually do very much. • Well oiled IT: this is where Agile takes you. But it leaves you there. • IT Enabled growth: where we all want to be. • those who are happy in the mud; i.e. those who lack the will to do something about it, those who believe IT is always like this, those who earn so much money elsewhere it doesn’t matter. The downturn will finish off many of the companies in the first two groups. Those in Well Oiled will probably be OK, and those who can move quickly will hopefully survive. Still, too many companies will survive despite being stuck in the Maintenance Zone. But, what do you do once you get to Well Oiled? The problem is that while Agile as we know it will get you there it won’t take you any further. It runs out of ideas. Companies could happily stay in Well Oiled, its a (relatively) nice place to be. And you will probably out compete your competitors. But some of the companies that make it - and those who are already there - will look to go further. This is where Chris Matt’s point on the Agile Journal site are relevant. Agile as we know it, has largely ignored the Business Analyst and Product Manager roles. The onsite-customer in XP lacks any kind of strategic view. It worked for the C3 team but they were just replacing an existing system, not inventing a new product or doing great innovation. Even so, the original customer nearly had a breakdown. Scrum is slightly better, it has a full Product Owner role, but it says nothing about how this role is undertaken. It only speaks about the Product Owner in the Scrum process. And Chris is right about “user stories.” They are a simple tool for communication with developers. They are not sufficient. To make matters worse most teams use them isolation, they do no adopt scenarios, actors or personas. 1. Recognise the importance of the Product Owner role and staff it properly. You need 1 Product Owner for every 3 to 7 Developers. The newer and more innovative your product the more you need. If you have an older less innovative product you might have 7 developers to 1 Product Owner. 2. Stop looking to Project Managers to fill the Product Owner role. They are not Product Owners and their training is very different. 3. Decide whether Product Owners in your company are Business Analysts or Product Managers. If you develop software for your own internal use (or one client) then they are BAs. If you sell your software (shrink wrap or online) they are Product Managers. If we are to move beyond Agile software development and build Agile companies it is essential we respect requirements. So far our success has all been based on shifting out the maintenance zone, the next challenge is to move on up. I’m used to getting a reaction from people when I outline the Alignment Trap, and my article in the Agile Journal - and the subsequent report on InfoQ - certainly stirred up some reaction. Immo Huneke mailed to point out that the Sloan piece doesn’t discuss how you measure alignment. I’m not sure how I would go about measuring alignment myself, after all what is alignment? Can it be measured objectively? There is a point here, and I myself am a guilty of making a jump from alignment to requirements. I’ve also used the phrases “doing the right thing” and “doing things right” quite loosely. The other point which we could argue about is “IT”. The Sloan piece talks about IT. There is no information on whether this relates to hardware, software, IT support or software development. Despite these caveats I think the central message still holds: getting effective is more beneficial than getting. Still, I want to make it clear I think knowing what you are doing is essential. And in the long term requirements aligned to the business are very important - see the blog entry that comes after this one. Its all a question of context. If you want to fix a broken IT organization I claim, and I believe the Alignment Trap supports this claim, it is best to start by making the organization effective then determining what needs doing. This context implies that there is an organization, and it is doing “stuff”. It knows some of what needs doing. You might be able to remove some “stuff” (or add more) but basically it is not short of work to do. I believe that in this situation discussions over what to do (alignment, requirements) are not effective because the history of failed deliveries means there is no trust and it means the business side tries to game the system by asking for more than they need because they believe It will always under deliver. This context also implies that the IT group is, in general, supporting the business. If your company sells Payroll software and your developers are currently writing a competitor to Grand Theft Auto then I think you would be right in question requirements on day one. But in general, if you sell Payroll software it is likely that your development group are working on Payroll software. In other words: you are better off being generally right than precisely wrong. Before you can tackle the requirements problem (and alignment) you need to build a delivery machine that can tackle it. The Machine that Changed the World contains an example I think illustrates the point here. Producing the body of a car requires a “stamp” to shape the metal for the car body. These stamps are large and take many months to create. In the 1980’s at General Motors a new car would be designed and when the design was finished work on a “stamp” would start. This created a delay of a year or more in producing the new car. At Toyota the general size parameters of a new car would be agreed early on in the process. The stamp team would start work on the new stamp before the design was finished. Only as the design neared completion would the stamp team complete the stamp. As a result Toyota did not have the same delay. The Toyota guys started off being generally right and narrowed in on the exact dimensions over time. At GM the desire to be always right held work back. A provocative piece from me in this month’s Agile Journal - Requirements Come Second. If you’ve not checked out the Agile Journal recently you might want to have a look, they’ve given the site a make-over and have added blogs, forums and all that community stuff. At the end of last year I was lucky enough to hear Dan Jones give a keynote talk at XP Day 2008. Dan is one of the authors of The Machine that Changed the World and as such is one of the fathers of Lean. Or at least father of the term Lean, I’m sure Dan would point out that he (and his co-authors) didn’t so much invent Lean as reveal it to the world. • When Dan, Jim Womack and Daniel Roos wrote did the research that resulted in The Machine that Changed the World they had to think of a term to describe what they found. Toyota Production System was too Toyota specific. They eventually came up with Lean. In the process they considered the name Agile but rejected it - “because it wouldn’t sell” he quibbed. • Later (someone who’s name he gave but I don’t remember) decided there should be an “American version of Lean” and decided to use the term Agile. As far as Dan can tell it is this source that the original Agile software people (those who wrote the Agile manifesto I guess) picked up on. • As far as Dan is concerned he doesn’t care which term we use, its all the same. I’m glad to hear Dan say this, certainly my flavour of Agile has long been influenced by Lean - even before the Poppendieck’s excellent Lean Software Development. I now feel more able than ever to talk about them as one. That said I think there is a subtle distinction, its actually a distinction that can be helpful on some context. Its also a distinction which helps explain why Agile is not XP even though XP is Agile and why there is more to Agile than Scrum. At the top there are specific Agile methods like XP, Scrum, Crystal, etc. These are quite prescriptive in their ways - some more than others. Each is an Agile method but none are Agile. Agile is a toolbox, these methods have chosen elements from the toolbox. Agile is more general, Agile is more of a value system, a philosophy. 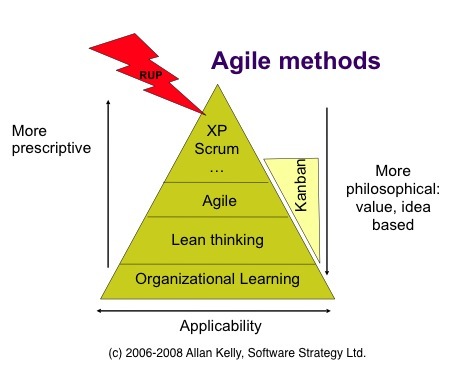 Agile itself is Lean but it is more prescriptive than Lean. Few Agile teams would not do Test Driven Development for example. So while Agile is more general than XP or Scrum it is less general than Lean. Lean itself is more philosophical still and contains fewer specific practices. You have to apply Lean thinking in your own context. Lean is a journey. Recently I’ve added RUP and Kanban to this diagram. RUP shares a lot in common with Agile methods but it comes from a very different place. It comes from traditional software engineering, it comes from the unification of object orientation and it comes from the commercial world. RUP can (I am told) be made to look and feel like Agile but this doesn’t change where it comes from. Then there is Kanban. Kanban is the new kid on the Agile block but it is derived more direct from Lean thinking. So for me it doesn’t inhabit that top apex of the pyramid, it draws on Agile and Lean. And this is where Dan Jones point is very appropriate: it doesn’t matter, at this level Agile and Lean are merging. So if you want to argue that it should be up there with XP and Scrum I don’t mind. Bristol BCS are holding a series of sessions entitled “Spring School - An Introduction to Agile Development”. I will be presenting the fourth and final session (23 March) on the “Future of Agile”. After slogging my way into London’s through the worst snow in 18 years on Monday and Tuesday this week to deliver a Agile Project Management course, I was a little relieved when Kingston & Croydon BCS cancelled last nights presentation - because of the weather. Still I was a sorry to miss the evening.